Protect your expensive LAN tester! 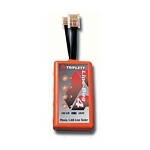 The Triplett Line-Bug 4 Phone/LAN Tester checks LAN lines (RJ-45) wired to 568 A/B standard for damaging telephone line current. A cctv viewing monitor for all-in-one camera maintenance. A testing device to view security cameras and surveillance systems. 4" Ruggedized IP (H.264/H.265) and Analog (AHD, AHD 2.0, TVI 2.0, HD-TVI 3.0, CVI 2.0, HD-CVI 3.0, & NTSC/PAL) security camera tester.